This book contains 46 essays originally published on the Hacknot web site between 2003 and 2006. They take a stab at some sacred cow of the software development field, such as Extreme Programming, Open Source and Function Point Analysis. 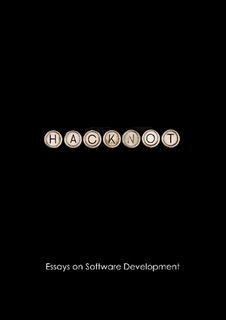 Many of the essays on Hacknot take a stab at some sacred cow of the software development field, such as Extreme Programming, Open Source and Function Point Analysis. These subjects tend to attract fanatical adherents who don’t take kindly to someone criticizing what for them has become an object of veneration. The vitriol of some of the e-mail I receive is testament to the fact that some people need to get out more and get a sense of perspective. It is partially because of the controversial nature of these topics that I have always written behind a pseudonym; either "Ed" or "Mr. Ed". I also favor anonymity because it makes a nice change from the relentless self-promotion engaged in by so many members of the IT community. This book is available for free at Lulu.com. You are required to enter your name and email address in order to download the book.